I don’t mean to keep spying on him, as he strips out of his clothes. But the thing i, I just don’t expect it. No one would expect it. Our heroine is a woman in hiding from an abusive past, a woman who keeps a low profile and has little more than a hope of getting herself on her feet without bringing notice to herself. So when she spies her neighbor openly pleasuring himself in his apartment, she can’t bring herself to look away. A part of her he had long since closed off suddenly flares to life, and she finds herself looking his way every evening when the lights are off and his curtains are the only ones open. When they pass each other during the day they acknowledge one another with nods and grunts, but at night…that’s when the magic happens. She gradually figures out that her neighbor purposefully has her mind, and they begin a strange, intense courtship that flirts amid the grey boundaries they have set for one another. They each have crippling neuroses caused by trauma, yet their attraction to one another develops at an addictive pace as they connect through letters and packages dropped in mailboxes, phone calls, and gradual in-person meetings. This is a crazy-intense story, one that’s hard to put in words to describe. I really enjoyed Ms. Stein’s writing. It was almost too easy to slip inside our heroine’s skin, to understand why she felt the way she did and why she was so drawn to her partner. it was heartbreaking to watch them ever so slowly come out of their shells, to witness them flailing like newborns in uncertain territory. It was brilliant. Loved this story – I’d highly recommend it if you’re looking for something that will leave you a bit haunted and moved. Oh, and IT’S ONLY $1.99!! 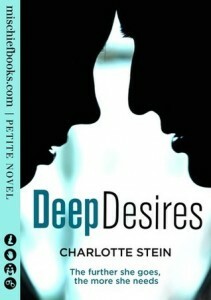 I’m a new Charlotte Stein fan. I’m definitely picking this one up. Thanks for the review! I just read this over the weekend. Really enjoyed it! Such a beautiful story! I can’t believe how much emotion and angst gets shown in this one! I loved it too!